My work ranges from individual elements to full gardens and landscaping. 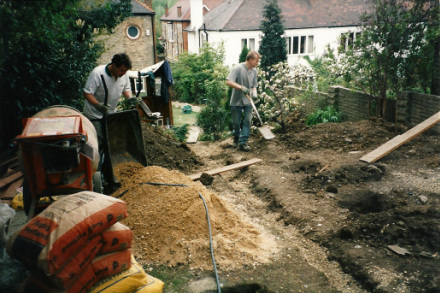 I can design and consult on projects anywhere, and I am happy to discuss the level of my involvement, but I only construct and make gardens in and around London. To start with, I would recommend an initial consultation. 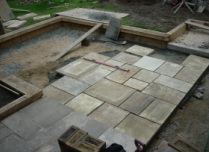 We can discuss your garden in general terms, and I can show you examples of work that may be helpful. As long as it is in the London area, the first consultation is free of charge, and you are under no obligation to proceed should you choose not to. Work would then begin on the design. In most cases I would be working on the costs too, and they would be supplied with the drawings. If any points or ideas come to mind during this time, I am happy to hear them, so that the presented scheme includes all the right elements. If we have discussed choices in the briefing, then I can present a number of options. I usually prefer to present the drawings and costs in person, as I am then able to discuss and explain any points immediately, though I can also send the work if required. and any visuals which are helpful. I am pleased to say, that the first presentation usually contains a design that is favoured, and any further design work is usually detailing. If any considerable further drawing is requested, then it is charged on an hourly basis, with a likely total cost given in advance.Upon agreement of the design and costs, we can then schedule in the work. Payment for the design work so far, is payable at this time, and before any implementation is started. I work with a small team on medium sized projects, and I am on site most of the time, so available to discuss details and progress in person. All work is undertaken with the least possible intrusion on the household. Where materials etc. have to be brought through the house, we always ensure that protective material is used on floors and walls if necessary. This part of the work would normally be taken on towards the end of the project. Normally I would present a detailed plant plan once the constructions are completed, and we can see the shape of the garden. Upon approval, the plants are sourced, supplied and planted, and if included, the lawn area is prepared, and turf is laid. and a lawn usually last of all. Details of payments will be agreed at the design stages. Generally, a proportion of the cost is paid on commencement of work, with staged payments thereafter, depending on the size of the project, the balance paid on completion. Although I do not undertake routine maintenance, I would be happy to discuss seasonal visits to assess the garden and do any work necessary to keep the garden in the best condition.